I adapted the following from a talk I gave during my rotation with the Center for Child Protection at Penn State Hershey. Most of the information was derived from a recent review by Teicher and colleagues in Nature. It’s got great pictures but I don’t think I can legally reuse them so I’m gonna try to go without. Basically, maltreatment and neglect during childhood turn out to be tremendously important in affecting the brain’s wiring and can lead to the development of psychiatric illness later in life. The surprising part, to me, was that the brain is changed so dramatically that MRI scans of the anatomy are affected. This is impressive because MRI can only detect fairly large changes (i.e. not microscopic rearrangements of neuronal appendages). In addition, there are clear changes in the functional response and the regional connectivity of the brain. The most important message I took away from my readings on the subject was that abuse and neglect lead to specific “Ecophenotype” changes. That is, withstanding abuse leads to specific brain changes that depend on the type of abuse and the severity/duration of that abuse, and that these changes are unique to that experience. Basically, if you get depression and you were abused as a child, your brain doesn’t look the same as someone who got depression without a history of abuse. There’s also evidence that people with a history of abuse will respond to therapy differently than people who weren’t abused. This could lead to important changes in the way psychiatrists and the various clinical therapists deal with mental health diagnoses in this population. From a research standpoint, it’s fascinating to look at the work that’s been done because it still doesn’t seem to be clear whether abuse leads to “toxic” changes – the brain changing because of an overwhelming stress – or adaptive changes – the brain changing because it’s protecting the user from a hostile environment. It’s very possible that the changes are part toxic and part adaptation, and that factors like type and severity of abuse affect the relative balance of these. In brief, the literature shows that the changes in the brain depend on path through which the abuse happens. If you’re abused verbally, the auditory cortex changes, and the white matter connections in certain language areas of the brain (the arcuate fasciculus, for example, which connects areas associated with speech production and recognition) show signs of breakdown. If you see domestic abuse, the visual association cortex shows decreases in grey matter volume, and white matter tracts that connect visual and emotional processing areas show signs of breakdown. If you’re a victim of childhood sexual abuse, the grey matter volume in visual cortices and sensory cortices show decreases in volume, and the amount of cortical real estate available for genital sensations is decreased. In short, it seems that the brain tries to dampen down pathways that led to traumatic information getting around. Without getting too deep into detail here, there were a few other interesting points. First, female brains seem to be more resistant to these changes compared to male brains. Whether this is some kind of hormonally mediated effect and whether it’s due to selective pressure (females are more often targeted by abuse and it’s likely that this has been the case well into evolutionary history) remain unknown. Also, one of the major findings that had been associated with depression, the decrease in hippocampal volume, seems to be specific to maltreatment and not specific to depression itself. This leads me to wonder how much of our psychiatric neuroimaging is drawing incomplete conclusions by not controlling for maltreatment. There’s also a lot of interesting connection in the neurobiology between maltreatment and psychiatric illness later in life. For instance, areas like the anterior cingulate cortex, dorsolateral prefrontal cortex, and orbitofrontal cortex that are affected by maltreatment and neglect have been associated with addiction, emotional regulation, and decision-making. This provides some concrete reasoning for focusing on abuse prevention and treatment as a way of preventing substance use disorders. It also provides some mechanisms for psychiatric disorders that are strongly correlated with an abuse history, like borderline personality disorder. I’ve only picked out a few of the major points, and I strongly recommend reading the review linked above, but hopefully I’ve been able to raise a little awareness about the importance of childhood trauma in mental health. It’s still not clear how much these findings will respond to treatment, but they will give us research tools to gauge the effectiveness of our therapies and medications, and they may give forensic psychiatrists more tools to support claims of emotional or sexual abuse, which classically don’t leave the same amount of physical evidence that juries get with physical abuse or prolonged neglect. So my parents got me a Warhammer Dark Vengeance set for Christmas, and unfortunately it didn’t take long for me to get hooked. A few weeks after getting started with it, I decided to expand my collection and found out that these little plastic people are really expensive. I looked around for alternatives to buying new, and it turns out there are tons of used minis on ebay and elsewhere. The downside is that these are already assembled and painted in many cases, so you don’t get to customize them to your liking and you may not care for the paint jobs of others. It turns out you can reliably strip the paint off with various solvents, going back to square one. I thought this was really cool, since it feels like upcycling and it gives you easier access to some of the older pewter figures. Be forewarned that newer sculpts tend to look a little more detailed and have some more customization, but I like the variety of blending older and newer minis and knowing that my army probably looks more unique as a result. Now, the trouble with stripping is choosing the right solvent. You want the paint gone, you may want the glue and green stuff gone, but you don’t want the plastic or pewter to melt away or become pitted. With credit where credit is due, I found this link via some quick googling that gave me a great place to start. Trouble is, most of those products weren’t in many of the places I looked. I encourage you to check there, especially if you’re in the UK, since they have access to some other stuff (like Fairy Power Spray) that supposedly works really well. In my case, I did some of my own research with a few solvents that this guy didn’t cover, and I thought the info might benefit someone else, so I’m throwing it up here. 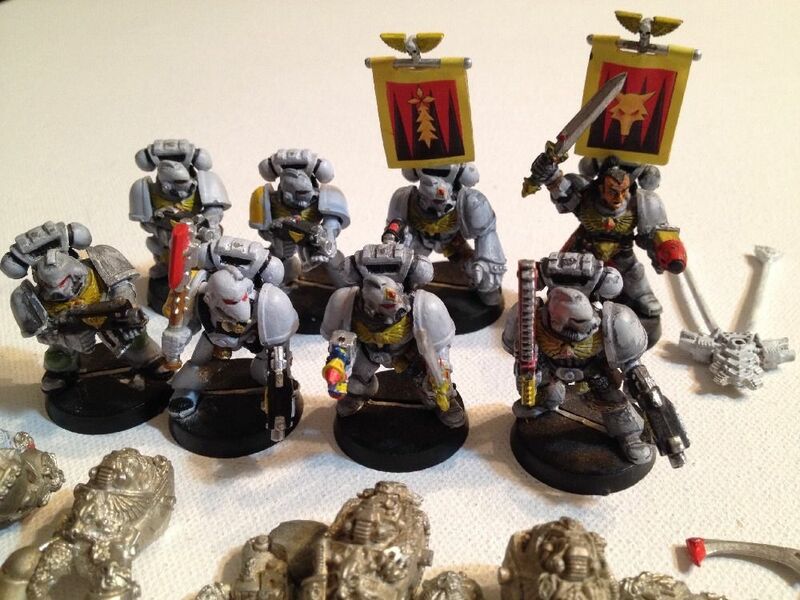 The Grey Hunters in their original state, painted sometime in the past. First up, what didn’t work. 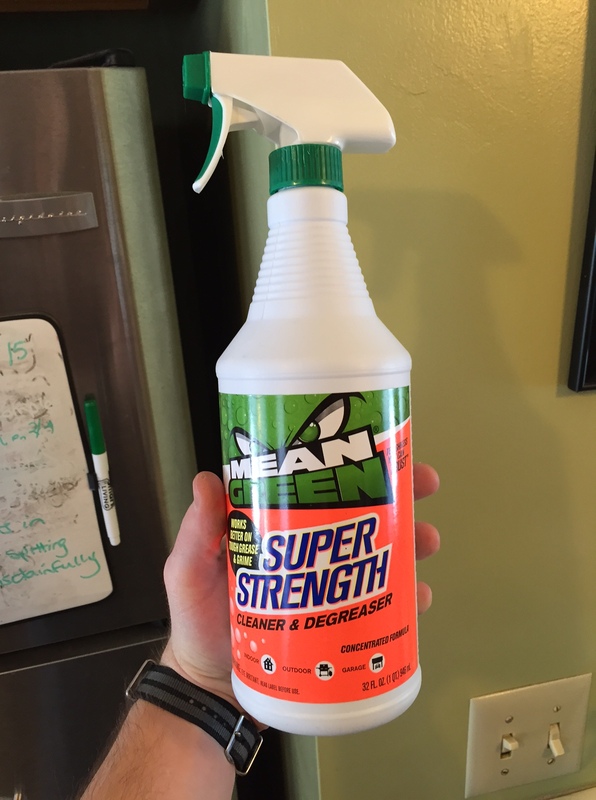 This stuff might be a perfectly good cleaner, but it didn’t do much for these purposes. With heavy toothbrushing I could get some paint off the pewter, but it did almost nothing to plastic. 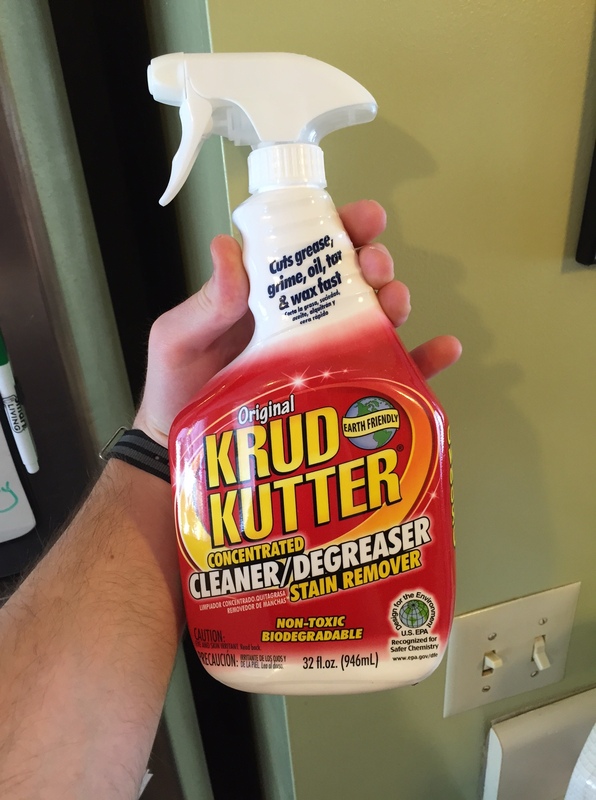 Despite being too xtrem3 for the letter c, I wasn’t able to get much to happen to the paint with Krud Kutter either. Some of the glue seals broke down in this, but I do not know what the original owner used for glue, so I can’t make much of that. Getting closer now, this stuff was decent. It takes an overnight soak to do much damage but I did get paint off of some plastic and pewter models using this stuff. You’ll have to give things a lot of elbow grease and it may take days to get the stubborn pieces clean. On the plus side, this seems to be fairly easy to find at super markets. I picked this up at a K-mart and later saw it at most of the other places I looked. Still too cool for the letter C.
I found this stuff at Home Depot, they probably carry it at comparable stores. 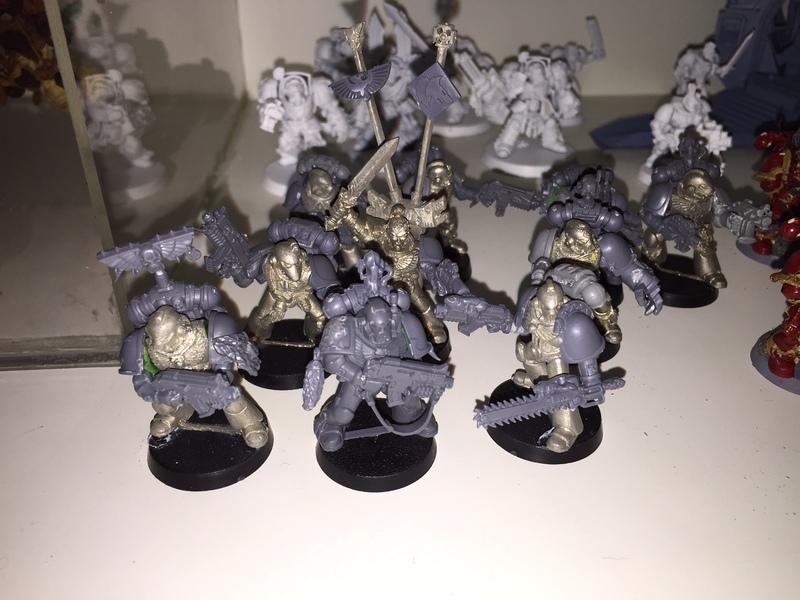 It bills itself as being specifically able to remove acrylic paint from all sorts of surfaces, and when I dipped my figs in the stuff, the paint softened and came off of both plastic and pewter in under a half hour. This is definitely my new go-to. The “after” shot. These have been stripped and reassembled with superglue and green stuff. Use a toothbrush as your primary weapon, and have some toothpicks and/or pins around for the detail work. Wear gloves of some sort, most of these are pretty hard on hands. The solvents I used were all fine in cheap plastic sandwich containers, but certain solvents require glass (e.g. Acetone, though I haven’t tried it.). Be sure you have an appropriate container. When you’re done, give everything a good wash in soapy water and a thorough rinse. Residues of the solvents can cause your primer to flake off. I learned this the hard way on some old Reaper minis I was experimenting with. Hopefully this is of some use to you wargaming and modeling enthusiasts out there. Are there any other solvents or tips we should know about? Feel free to comment. A list of R tutorials, which are not hosted in the webpages of academic institutes can be foundhere. The freshly assembled BoEBot with my Arduino Uno R3 nestled inside. So I’ve gone through most of my life pretty ignorant of electronics. I built a computer in high school with some help, but beyond plugging together big pieces of “FM” (f***ing magic), I didn’t really get what was going on. However, in the last few years there’s been an explosion in products and resources related to prototyping and small scale computers, and I thought it was time to see what all the fuss was about. In the interest of balance, I should mention that the three most prominent platforms right now are the Arduino, the Raspberry Pi, and the BeagleBone. The latter two may well be incredible, but I haven’t had the time or money to look into them yet, so I’ll leave it to others to describe their merits. As for the Arduino, it looked like a good starting point for a few reasons. Firstly, the open source nature of the hardware appealed to me. First party Arduinos have a nice build quality and are available in a number of variants. What’s more, tons of other manufacturers are making slight variants for more specialized ends, and you’re theoretically at liberty to try to build one yourself if you think you can do it more cheaply or more effectively. Second, the Arduino platform is geared more toward electronics projects with a relatively simple codebase. I’ve already spent some time in programming world and I was more interested in soldering and making circuits, so this suited my curiosity well. In contrast, the Raspberry Pi is known for being a full-fledged computer, albeit a rather basic one. That seemed like overkill for me. The affordability of the Arduino was another plus. I picked up the official starter kit (got it for Christmas, actually), which came with a book and a good set of starter components. This runs between $100 and $150 at the moment, and there are tons of kits from other vendors with slight variations on the same starter pack theme that will probably get you up and running just as nicely. To supplement the kit, extra Arduino Uno R3’s (the main entry-level board) are available for around $35 online and at local retailers, and expansion shields and parts are generally affordable. Lastly, there’s tons of support for Arduino, with a wealth of tutorials online and books on every theme you can imagine. The expansion “shields” are a great feature, too. You basically snap them on top of your board and add some functionality (GPS, extra motor controllers, cellular functionality, bluetooth, etc.) with little to no hardware experience required. This can get you up and running a lot faster if there’s something specific you want to do. On the other hand, you can generally accomplish the same thing manually if you want to customize it or learn more about the inner workings of the technology. I made it through the starter kit guidebook from beginning to end in about two months of occasional spare time tinkering. The instructions were easy to follow and the finished code made it exceptionally simple to test the hardware without having to worry if you messed up the software side. My only issues were that the components didn’t often sit in the breadboard (that is, the board full of holes that you use to mock up your circuit) very securely, and that one of the leads fell off my motor. It’d be nice if they addressed the fit issue, but I’m sure it comes up eventually in post-kit electronics world. If you want to be safe, make sure you have a soldering kit and a few different kinds of connector wires (male-male, male-female, female-female) to solve any of these minor issues. After I made it through the original kit, I moved on to some robotics. While Arduino sells an official robotics platform that looks pretty solid, it was a little more than I wanted to pay at this level. Instead, I found a kit by Parallax that allowed the mounting of the Uno R3 that I already had to a “Board of Education” shield and a basic two-wheeled robot chassis. I guess this “BoE-Bot” is a pretty widely-used form factor that’s been around since before the Arduino, and it was more affordable than the standalone Arduino robot by a wide margin. I took the plunge on the kit, and found that it only took about an hour to have the thing in working shape. I did lack a book, but there was an online tutorial set that proved just as helpful, including up-to-date code snippets that could be used with the example hardware setups. As of now, I’ve worked my way through all of their example projects and have begun expanding the bot with my own ideas. 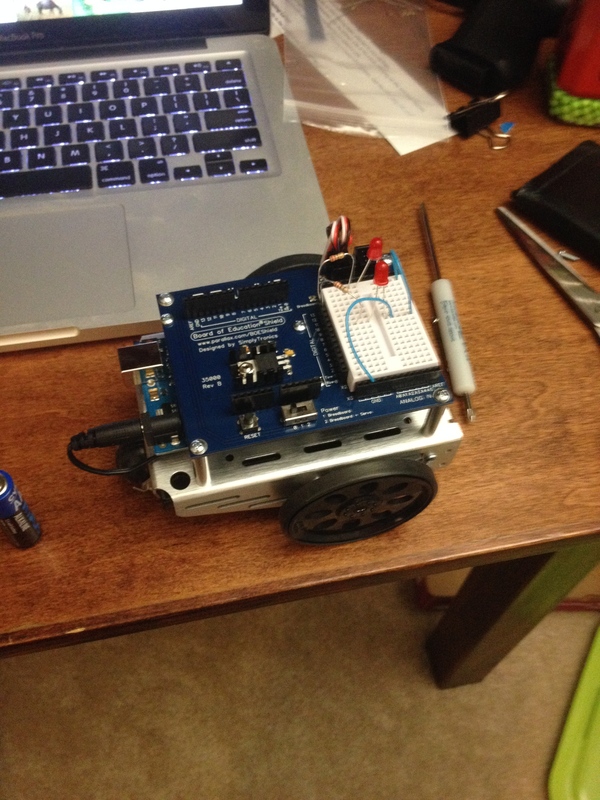 In contrast to the Arduino kit, the robot kit fit together nicely at all steps. The BoE shield is a nice feature thanks to the attached breadboard and the formal servo connectors, saving breadboard space for custom work. The example programs are enough to whet your appetite, showing you how to get your robot to respond to light and obstacles using both physical whiskers and an IR system. It’ll leave you wanting to do more, but that’s sort of the point, isn’t it? So far this kit seems to have been a good choice, and I’ll post an update down the road to fill you in on customization options and maybe offer up some project ideas if I do anything worth sharing. In conclusion, it seems to me that Arduino’s a legit way to learn a few things about electronics and robotics and has enough flexibility to allow you to make something new and cool with a little work. If there’s a better gateway board, I haven’t yet found it, but I’m open to suggestions. 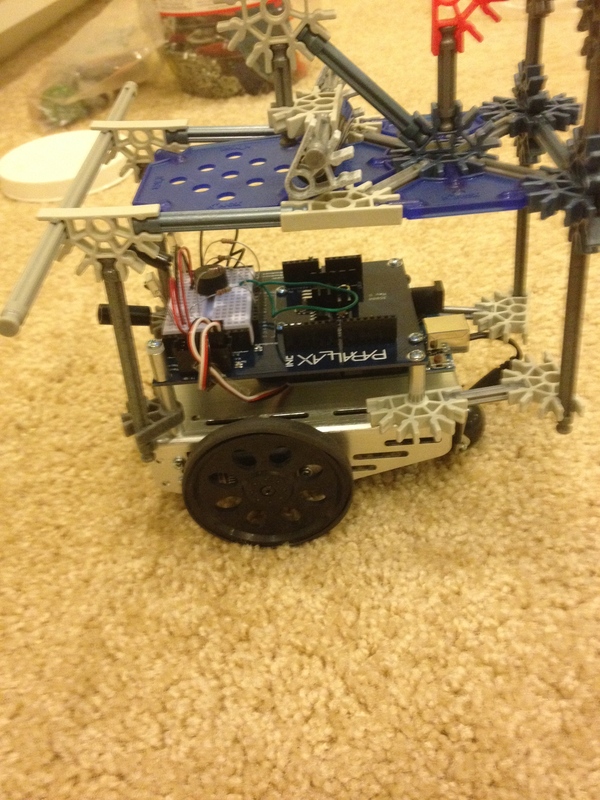 The BoE bot with IR sensors and some K’nex on board – The posts are conveniently the perfect size to attach K’nex pieces. Amazon – they have a pretty good selection but there are some problems with vendors substituting knockoffs without warning, so you may have to go through a return or two to get what you’re looking for. Arduino.cc – the official Arduino site for both tutorials and the original boards and shields. So I’ve been using HabitRPG pretty much religiously for about a half year now, and it’s changed enough that I thought it warranted a new post to complement my older reflections. The pace of development is brisk, and the amount of content has grown exponentially since its early days, offering a number of new ways to play. It’s worth noting that the team is really receptive to community input, as well. In fact, one of the features implemented in the new subscription plan – the ability to purchase the rarer gem currency using the gold that can be earned in-game – arose in part because of my criticism and discussions with the team. It’s clear that Renelle and his team are committed to folding improvements into the game over time, which makes it considerably more usable, and gives me greater confidence that I won’t likely hit another wall where there’s really nothing more to do. To those of you who haven’t read my original post, I encourage you to check that out first here. To bring you up to speed, many of my criticisms from that period are no longer relevant. At the time, the supply of content for ordinary users was easily exhaustible – one could expect to have every piece of equipment in the game in a few months – and there was not very much in-game motivation to play after that point. A common counter-argument to my complaints has been that I wasn’t making use of custom rewards – things like paying in-game gold to watch a movie or go out with friends. While this is definitely a valid way to add life to the game, it’s not very satisfying when I don’t necessarily have the time or money to indulge in a real reward, but do enjoy seeing my pixel dude wearing a fancier hat. Fortunately, as you’ll see below, my play style is now much more feasible and should stay that way for some time to come. So without further ado, and doing my best not to simply echo their update list, here are my feelings about the game as it stands today. – The addition of classes is a fantastic way to add personality to your character. It adds some depth of gamification, allows you to think a bit about the kind of person you want to be, and gives you more ways to interact with your party. Furthermore, by virtue of quadrupling the amount of obtainable equipment, it extends the life of the game considerably. I’m still in the midst of picking up gear for my third class, and plan to have it all one day. – On a related note, the addition of quests gives not only an added sense of cohesion with your party, but also additional incentives to work hard on any given day. Trying to take down a boss character over a period of weeks gives you a sense of more urgent purpose, and gives you something to talk about with your party members. It looks like they’re still massaging out the details of this, but there’s a lot of potential in that concept. – The development team’s embrace of seasonal content is a neat feature. Limited-time items give you special incentive to complete your tasks by certain deadlines so you can have the special 2013 winter outfit on your pixel dude. – The addition of mounts adds a whole new layer to pet collection, since you can now feed your pets until they grow big enough to ride on. The only shame part is that neither pets nor mounts affect your stats in any way, but they’re still a nice diversion, and I suppose the stat effects might be added someday if people ask for it. – The subscription plan for monetization just launched this morning, and I think it’s a vastly superior alternative to buying gems outright. For a fairly manageable $5 a month, you get a few nice perks including the ability to buy gems with gold, which addresses the biggest problem I had with the game a few months ago. Now it’s possible to actually earn, through your habits, basically all of the content in the game. I’m still jealous of the folks out there who have special kickstarter and contributer gear, I’ll admit, but there is a vast wealth of material available for the rest of us, making it considerably easier to forget that we’ll never have a cerberus pet or a steaming demon sword. With the continuous addition of content for quests, however, there’s no telling what the future holds – we may someday hope to have at least watered down versions of those sorts of things depending on the direction the developers go. – Another simple change: It’s now possible to purchase a “rebirth.” I’m not sure what carries over when you reset your character that way, but in theory it allows you to start from scratch and experience the thrills of improving from a simple person in a t-shirt to a badass wizard, warrior, etc. all over again. For people like me who are primarily motivated by in-game growth, this effectively fixes the problem of maxing out our characters and having nothing else to do. – In the interest of balanced review, I should say that the game mechanics still aren’t perfect, and I imagine some of the character skills will be getting adjusted in the future to improve playability (for example, one of the rogue skills yields entirely too much gold for its own good), but it’s easy enough to avoid problems with these. In my opinion, you’re only ever cheating yourself if you cheese the system. After all, there’s really nothing stopping you from giving yourself points for playing candy crush and eating potato chips, so there are some ways in which the game is only useful if you’re committed to the spirit in which it was developed. In short, I’m satisfied with the game and impressed with the direction it’s going. I was also duly impressed with the team’s attitude and their openness to input, as evidenced by my being invited to discuss their subscription plan strategy after they read some of my thoughts on the previous blog entry. I know this will probably become more difficult as the size of the user base increases, but for the time being it seems that the core developers are very interested in adapting to what the players want, which gives me confidence that the platform will continue to improve and is well worth throwing a few dollars a month at. This is going to be a little more of a plain and somber post compared to what I usually put here, just to offer you fair warning. Last weekend, my aunt Sara passed away after a sudden bout of liver failure. She went from being around – with a fair bit of pain from some chronic conditions – to being gone forever in the span of two days. What’s most surreal to me is that I never had the chance to properly say goodbye, and I don’t even really remember which occasion was the last time I saw her. Certainly, it was one of the days surrounding my brother’s wedding last September, but it wasn’t the sort of heavy, emotional I’ll-never-see-you-again sort of goodbye that I would’ve given if I had known what was going to happen a few months later. My aunt lived a hard life, and suffered the consequences of her decisions and circumstances for many years. In the years I knew her best, she was making a great effort to turn her life around. She’d found love and support, she’d gotten some education, and she had done her best to stay on a path that would lead her away from a troubled past. I hope she understood that others noticed. I hope she knew that, even though she didn’t always succeed, it meant a lot that she was trying. While she never got the chance to enjoy a full life, I hope it’s some consolation that she will continue to inspire others even now that she’s gone. For my part, she will always remind me of the idea that it’s never too late to fight your past, and that no fall is so great that you cannot stand again. I know that many of you reading this won’t have known Sara, and for you I have a message that hopefully you can all relate to. While the beginnings of new things are usually obvious, and we can see a new “first time” coming a long way off, it’s taken me these twenty seven years of my life to grasp fully the fact that many endings come and go without our realizing. Whether it’s something as mundane as the last time you visit a restaurant before it closes or something as monumental as the last time you see a loved one before they pass away, you may go through that finale without realizing that it’s the end of something. Years may pass before you understand that it should’ve meant something, that you would’ve liked to soak in that experience and put a proper seal on a piece of life. Bearing that in mind, I’m not suggesting we should make every goodbye tearful and dramatic. However, I think it’s worth carrying that thought with you, somewhere under the surface, that we ought to cherish each experience with as much mindfulness and gratitude as we can muster, because sooner or later it will be the last time, and we’ll wish we had known. The basic interface is clean, and serves as a nice compromise between traditional to-do lists and an RPG-style status screen. In keeping with my general interest in gamification, I was floored when I found out about a web app called HabitRPG that promises to gamify your daily habits and reward you with various gimmicks (avatar upgrades, pets, etc). I’ve given it a try for a little over a week now and I think I’ve got enough insight to discuss some of my impressions. In general, I think they’re onto something in a big way, and I believe that stroking the human reward circuitry with small but frequent rewards is the key to becoming the best people we can be. Several times in my wade through the site, I found myself wishing I had come up with the idea first. (On a side note, their project is open source, so the good news is that someone else could pick up the ball in the event that they gave up on it somewhere down the line). 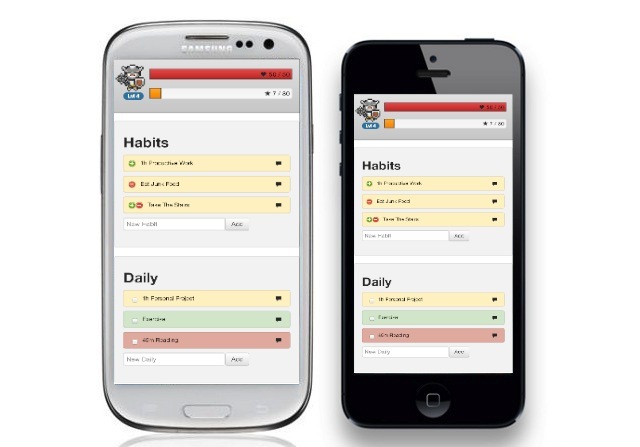 For those of you who want an idea what the site’s all about, it’s based around the idea of listing out the habits you want to track – one-time to-dos, daily routines, and intermittent habits that you’d like to do more or less often, and then providing you with a system to reward and punish yourself. As the name implies, it’s inspired by role-playing game mechanics including health, (which depletes if you do a bad habit or miss a daily task) experience (which accumulates as you do good things and yields level increases that unlock site features), and gold (which you can use to unlock rewards like avatar equipment). It’s fairly intuitive once you understand the central mechanics, and the rewards make for a more interesting experience than you’d find in plainer to-do organizer. If my program gave out pixel dudes, I’d have three PhDs by now. In the time since I’ve started using it, I’ve already noticed more motivation to stay on top of my daily habits (I recently had an evening meeting that tempted me to skip a workout, a meditation session, and some guitar practice, but I forced myself to stick to all three when I got back lest I lose my streak.) What’s more, it’s given me motivation to take on tasks that I had largely ignored before. For example, I’m not the best at keeping on top of chores, but I find myself making a priority to hit a few simple ones as often as possible thanks to the looming promise of seeing a little pixelated version of myself in chain mail. Therefore, I can see how this could definitely help me use my time wisely and keep moving forward. Here’s the breakdown of the pros and cons as I see them. – While it’s still under development, there has been some care taken to allow you to restore your character if the game crashes and robs you of a streak or an achievement. This is vital, since I’ve already needed to do that once and I can imagine the epic ragequit that would ensue if I’d already invested a lot of time and energy. – The dual accountability systems of parties and guilds allows for some great opportunities to get support from friends and like-minded people. Granted it’s not much help if none of your friends are productivity geeks, but it’s nice to know that others will get to see your avatar dude clad in the coolest gear. – Although I have not yet delved into it deeply, the creators are pursing integration with other programs pretty aggressively. This is wonderful for people who use a lot of gamified apps, organizers, and productivity tools. Ideally, it would be nice to go about my day as normal and have HabitRPG credit me for my web behavior (via the chrome extension), my to-dos (via Trello or similar), etc. This functionality seems to be in the works, but all the bugs aren’t yet worked out. – The price is right. Without paying a dime, you get essentially full functionality with a couple of ads that don’t distract too much. I worry a bit that this could lead to some unsavory monetization tactics down the road, but I’ll give them the benefit of the doubt that they could monetize it without breaking the app for free members. – The development pace appears brisk. The mobile app coming out soon has the potential to make it much easier to keep up on, and it seems like the authors have their ducks in a row, organizing their emerging features and bug fixes via a group Trello account that anyone can see. The upcoming mobile app release will make it a lot easier to maintain your account. – The user-generated tasks and difficulties create somewhat of an apples to oranges environment. Obviously cheating will always be possible with apps like these, but here it’s totally possible for two honest players to have completely different levels and scores for doing the same things, all depending on how they’ve set up their lists and what they give themselves credit for. I think that it would be beneficial for there to be a library of democratically decided tasks to choose from, so you stand a better chance of being on the same page with your friends. – The gem system worries me a little bit. It smacks of the special currencies in so many of the gimmicky facebook games, where there’s no access to certain perks without spending real money. In closing, I think this is worth checking out, and is a viable alternative to other habit tracking sites like alive.do, lift, and so forth. It’s not yet my sole to-do manager, but I could definitely see it being a major hub to keep myself organized in the future. There’s a lot of potential in this concept, so I hope to see it turn into something even more addictive in a couple of years. Development is ongoing, and features are being added with some regularity. However, the developers have a clear priority for making exclusive content for backers and contributors, and much of the other optional content is only available for purchase using gems. I understand that the developers need to make money to keep the site going, but I’d rather have them break down and charge money or use more obtrusive advertising instead of dividing the game into “haves” and “have nots” and spoiling their inner circle with perks. It doesn’t make sense to me that I should have to learn how to program and contribute to their project if I want to get all the achievements and upgrades. Related to the above issue, my earlier fears about this gem system have been confirmed. Much like the free-to-play facebook games that award one currency freely but keep an unrelated currency in extremely short supply, I find myself drowning in gold while I have no way of getting gems without buying them outright with real money. This has seriously diminished my motivation to continue using the platform, and in fact I’m debating forking the code to see if I can work from a local install where I can buy gems and drops with gold so that I have some way to progress. The fact that the game is constantly under development sort of ruins the current gold mechanic. There is talk of adding character classes at some point, so I’d rather hoard my gold and buy equipment for the other character types when it arrives rather than creating my own (out-of-game) rewards and losing the gold when I need it to improve the game. The item drop system is arbitrarily capped at 2 per day (at least it was when I looked into it). Because I have several dailies with long streaks, this cap was usually maxed out fairly early in the day, meaning I didn’t get any particularly interesting rewards for everything else I was hoping to do that day. I’m not really sure why there needs to be a cap at all, but I found it ruined my motivation when I was checking boxes for nothing but a little bit of (currently useless) gold. The item drop system really should consider what’s in your reserves before dropping an item, especially in light of the extremely limited cap. I’m sitting on over a dozen animal eggs at the moment and have never had a surplus of either food or hatching potions. I understand that this would take a little bit of extra programming, but the developers have to consider that most regular users are going to hit an “endgame” state pretty fast given the relative ease of maxing out the weapons and armor, and it’s lame to keep getting wolf eggs when I already have enough to hatch every wolf cub in the game. Yet another complaint about the item drop system: It’s possible to sell eggs back to the stable, but only for gold. This is better than nothing, but it again does nothing for players who have bought all that there is to buy. The challenges system has been implemented, and promises an in-game way to obtain gems, but so far I haven’t found any use for it. Usually, by the time I find a challenge that’s relevant to me, it’s already been going for a few days and it’s impossible for me to win. I don’t really have time to check every day to see if there are official challenges being launched for the stuff I’m already doing, but if I wanted to win gems in game I would have to do that and move from the daily version I’m already using to the one supplied in the challenge. In short, it’s a nice idea but it’s not really geared toward people who are already on top of things. In conclusion, HabitRPG is still a great premise, but its gamification features start to fall apart after a few months of successful “gameplay.” Mostly, I feel like it’s badly in need of additional content to keep the core gameplay going. If they had hundreds of armor pieces to purchase, even if they were purely cosmetic, it would at least give players something to work for. I feel like there’s a wall in place, and the only people who are getting the full experience are those who have been friends of the project from the beginning. If you already contribute to the project regularly, backed the kickstarter, and feel comfortable paying money for gems, then you get to be a special class of player with diamond armor, unique pets, and achievements specific to contributors. For the rest of us, we’re relegated to a sort of proletarian status where we’ll have to be content with an arbitrary blockade in our progress because we serve our own goals rather than those of the habitRPG team. If I were in charge, I would do away with most of the special privileges and allow anyone to buy “habitRPG premium” for some annual fee, which would enable all of the in-game content to be buyable with gold.